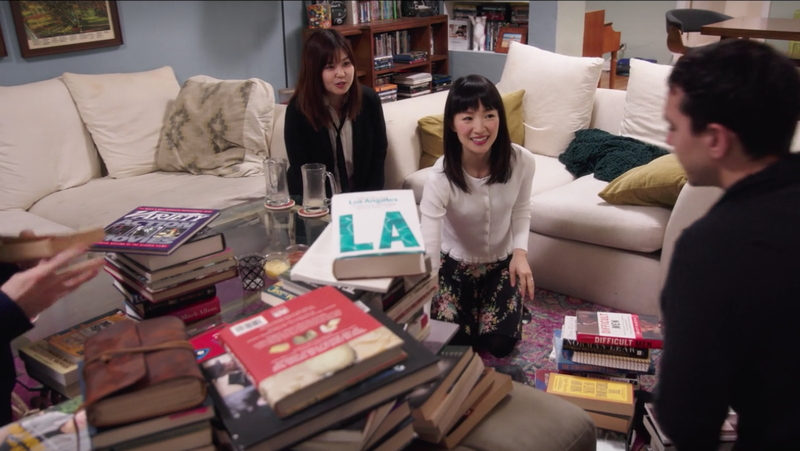 Someone recently posted this article in response to a mention of Marie Kondo on Facebook, and I had a few thoughts regarding it. Especially with what’s going on the government these days, it’s probably never a good idea to outright dismiss charges of racism and classism, yet I still have to wonder how many people know that the get-rid-of-your-stuff lady even IS Japanese. I guess they do now that she has the TV show, but before that, I don’t know. From my own perspective, which very rarely matches anyone else’s, I first heard of the “get rid of possessions that don’t spark joy” idea at a party a few years ago (that wasn’t the point of the party; it just came up in conversation), and I had no idea who came up with it. I just thought it sounded faddish, and like a quick-fix sort of thing that didn’t take nuances into consideration. When a Simpsons episode addressed the topic, they acknowledged the Japanese origin but didn’t mention Kondo. They basically indicated that it was an idea espoused by warrior monks, but aren’t they a Buddhist institution, while Kondo identifies it as a Shinto practice? I suppose the Buddhist teaching of avoiding attachments makes it likely that they’d support the idea, but that’s just a guess. But then, with some exceptions, The Simpsons tends to fictionalize the origins of real fads (or at least of how those fads come to Springfield in particular), and sometimes combine a few different ones. And part of the conclusion of the episode went along with what I think, that just because something doesn’t bring you joy in the present moment doesn’t mean you won’t change your mind. I guess I’ve heard too much about people who get rid of something, only to want to buy that exact same thing several years down the road. But then, I’m someone who always feels a bit uneasy getting rid of something that isn’t obviously trash. That’s probably how hoarders start, but I think the problem with hoarding isn’t simply having a lot of stuff, but having stuff to the point that it makes your living situation dangerous. On the other hand, I do often find the rare occasions when I do get rid of things to be a relief, so I can see a few different perspectives here. What’s gotten a lot of people on the Internet worked up is a misinterpretation of Kondo saying she only keeps about thirty books, which was spread as her saying NOBODY should have more than thirty books. Obviously this is a very personal thing. I’m a bit of a book collector, although nowhere near the level of a lot of people I know; and I often find myself going back to the same books again and again either to reread or to look things up. But perhaps Kondo and the people she’s talking to don’t routinely write about minor aspects of children’s fantasy. I’ve also heard that books tend not to last as long in Japan. The article mentions Ananka Schofield’s tweet about how books can bring a lot of feelings other than joy, which I agree is missing the point. On the other hand, I’m often overly literal myself, so I can’t fairly fault that in others. (Schofield’s tweet no longer shows up, by the way, quite likely because of the backlash.) Ellen Oh’s response was, “Tokimeki doesn’t actually mean joy. It means throb, excitement, palpitation.” Really, that seems to raise the stakes a bit; there are certainly things I enjoy that don’t actively make my heart pound with emotion. And I’m not sure Martha Stewart is a good example of someone people WOULDN’T double down on criticizing. Wasn’t it common for people to think she was some kind of psychopath? Maybe it still is. As for privilege, well, books can be pretty cheap if you know where to look and don’t mind getting lower-quality copies. Obviously not being able to afford them at all is one thing, but if you have amassed a lot of them over the years, I’d say it’s easier to keep them (or, alternatively, to throw a bunch out randomly whether or not they bring you joy). Not everyone can afford storage space, but not everyone can afford the time to evaluate every single thing they already own one by one, either. But then, cleaning up is not something that brings me joy no matter how you translate it. I will say I’ve become somewhat more discerning in terms of what books I’ll buy or ask for as gifts. So many things are available on Kindle or through the library (DISCLAIMER: I live in Brooklyn; this was not so true of other library systems I’ve lived in previously) that it’s become rather less necessary to take up space with books. Still, while I may think the KonMari method (at least as I’ve seen it explained) is short-sighted and time-consuming, it’s not actively harmful either. In a culture where other heavily-promoted self-help gurus have encouraged such things as not vaccinating kids, drinking non-pasteurized milk, crash diets, curing cancer by drinking vinegar, and being able to get anything you want just by imagining it vividly, getting rid of stuff you don’t like is pretty damned mild. This entry was posted in Buddhism, Prejudice, Religion, Shinto, Snobbery, Television, The Simpsons and tagged ananka schofield, books, cleaning, elitism, ellen oh, fads, joy, konmari method, marie kondo, martha stewart, racism, tokimeki. Bookmark the permalink.